Recently, a couple of my clients have experienced some seriously exciting developments in their speaking careers. Several of them will soon be speaking on TEDx stages in a variety of places, making one of their biggest speaking dreams come true. But these engagements don’t just fall out of the sky; you have to put yourself out there in order to make them happen. In today’s episode, I’m touching on this topic and continuing the trend from last week’s episode. I’ll be sharing a chapter from my book, Beyond Applause: Make a Meaningful Difference through Transformational Speaking, that explains the crucial elements of outreach that will help you become your industry’s thought leader. You can still get the book for free at that link, as well as a video course that complements all of its material beautifully. The focus of this excerpt is on the Five “C”s of transformational thought leadership, a framework that I use with my clients to ensure that all of their conversations, emails, and other outreach have real power and conviction behind them. It’s up to you to reach out to your dream audiences and offer them value, but this framework can help you uncover where your pitch and your speaking could use some extra polishing. Why you have to be brave and put yourself out there if you want to land your dream speaking engagement. How I developed the framework for the Five “C”s of Transformational Thought Leadership. Two of the paths to becoming a thought leader in your industry. Why you shouldn’t shy away from a speaking career if other people in your life don’t understand that it’s your calling. What you need to have in place so that your communications get you closer to your goal of becoming a go-to thought leader. An example of the Five “C”s in action. Download Beyond Applause: Make a Meaningful Difference through Transformational Speaking for free and gain access a four-part course on becoming a thought leader in your industry. 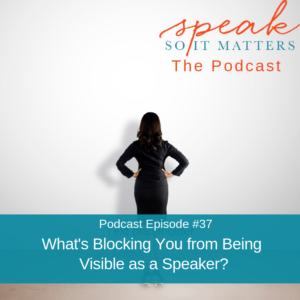 You are listening to the Speak So It Matters Podcast, episode #37. Welcome to Speak So It Matters , where we share a mix of stories of inspiration and super practical public speaking and communication guidance to help you release all the barriers to becoming the speaker you know you’re meant to be. Some of us are called to use our voice, to serve others and our world. As well as to become the most fully expressed version of ourselves. If that’s you, you landed in the right place. Let’s do this my friends. Hello my speaker friends, as usual, I’m so delighted to be here with you this week. I have had the most fun week with client news. I wanted to share it with you because I think it’s so inspiring. I was counting it up and right around now, over the last couple of months because these kinds of talks take a while to prepare, I have had 4 clients working on awesome Ted Talks. They’re doing Ted Talks at these TedX Events and all different places. It’s just so cool because here’s what I hear from so many people, clients, and also just people I talk to about their speaking. People in the podcast audience who write to me, there’s this big question of how do you get an opportunity like speaking on a TedX stage. These stories are just so fun, some of them are because they have connections. It really works like so many things in our world, if you know someone who is on a TedX team, of course, it’s a lot easier to get your idea considered. That doesn’t mean you automatically get a spot, of course, a really good TedX event is gonna be very thoughtful and careful about who they bring onto their stage, no matter how much they know you, how good of friends you are. Of course, you move through a lot of the filters that might buffer you from getting the opportunity to even share your idea. So, of course, some of them happen that way, but some of them have happened where literally it was just like a super quick application. Like I’m just gonna send this in last minute, I’m just gonna give it a shot and see what happens. You know what, sometimes that works too. I’ve had that work for me, just had this super fun story about a TEDx event with a client where that happened. This time right under the wire of the deadline, so if you’re sitting around thinking I’d really love to speak on this particular stage or offer to do a talk for this organization. Maybe a lunch and learn, I mean really what would happen if you just tossed them an email? Said hey I don’t mean to be strategic at all, of course, do your research, who is this audience? How does your topic serve their audience in a way that really matters? You want this to be a thoughtful email, but still you just never know what’ll happen. Here’s what we do know, if you don’t put it out there you’re not going to get the opportunity, at least your chances are very slim. Of course, especially as you’re out there speaking more and more you’re gonna be invited onto stages. I have clients who are regularly filtering speaking opportunities, of course, because the more you’re out there and recognized as a thought leader… There are two things really, you’re recognized as a thought leader in that particular area on that topic, and so the thought is really logically well we wanna have a theme around this kind of topic, or our audience is really interested in this topic. Obviously, this person is a person to contact because they’re a known thought leader in that industry. So one way is to become a known thought leader. That’s really what my book, Beyond Applause, is about. How do you step into that role as a leader in your industry? The other way to do it, as I talk about in the book, is to do something really, really remarkable that’s super exciting for other people to hear about. Usually, wrap up some learning around it, right? Land an airplane on a small body of water and of course become a good speaker and make this an important, meaningful lesson for companies, but it makes it a lot easier for them to draw you onto the stage if you’ve got a captivating story built in. So do something really remarkable that’s exciting for audiences to hear about, and then turn it into some great speaking. Or do the systematic work of putting yourself out there and sharing your ideas and your stories. Over time you become recognized for thought leadership. So anyway, I didn’t mean to go off on that long description of how to get these kind of speaking opportunities. I just thought it was so inspiring to share with you that there are this many people with all kinds of different backgrounds who are stepping onto TedX stages, which was high up on their list of places they wanted to speak. So wherever that is for you, wherever that stage is, just what’s the next thing you could do? A little audience analysis, find out who the contact person is, tough it out there. That is how it happens my friends. So today I’m gonna do another reading from Beyond Applause, a little like audiobook excerpt. Thank you so much to those of you who shared their wonderful feedback about the audiobook idea. I’m really excited about it, I’m getting more and more excited about that idea. Those of you who enjoyed the last audiobook excerpt. So I thought I would do another one, really because it also ties back into what I started this episode talking about. Which is when you send that email when you just go ahead and go for it what are you gonna say? This is really about what you need to have in place so that you can become a recognized thought leader, but also so that email, that outreach, that conversation you have with someone has power and juice behind it. So I’m gonna read to you from Beyond Applause: Make a Meaningful Difference through Transformational Speaking, by Michelle Berry Franko, moi. I’m gonna read to you from Chapter 5. This is on page 45 in the book, Introduction to the 5 C’s of Transformational Thought Leadership. Before that let me give you a little background, and remind you that you can get a copy, a free copy of Beyond Applause at michelleberryfranko.com/freebook, all one word. Not only do you get a full PDF of this book, but you also get a guided video course that takes you through the process of establishing yourself as a thought leader. So they kind of work beautifully together, a lot of the content is similar, but there’s sort of two different ways to come at it. I give you some good examples in the video course as well, so you can get all of that free at michelleberryfranko.com/freebook. Now I chose this section, this excerpt from the book, which is just a bit after the one that I read in Episode 36 of the Speaks so It Matters Podcast. This really establishes the foundation of your thought leadership, and I had this really powerful realization during a walk in the woods. I tell you that story by reading this book excerpt, so I’m gonna talk that. We’re gonna talk about the 5 C’s of transformational thought leadership that are really that foundation of putting yourself out there. If you’re struggling to be visible, to sort of consistently put yourself out there, it’s probably one of these 5 things. So it’s powerful to put a name to these, and then you can kind of estimate which of these might be an issue for me. The rest of book does address these in more detail, so I don’t wanna jump the gun anymore on here. Let me dive into the reading. So this is page 45 of Beyond Applause. Chapter 5, Introduction to the 5 C’s of Transformational Thought Leadership. About 6 years ago I had a poignant moment in my business that lead to a dramatic change in the way I understand and work with my thought leadership clients. I had just read an email for a client who was questioning everything about the talk she had just spent weeks crafting and refining. She was considering scrapping it all and starting over, wondering if all this work she was doing was ridiculous, and that maybe she should just focus on her children and family for a while. This conversation was so familiar to me that I felt my heart sink like a heavy rock in a glass of water. Why was this happening so often? Why were so many of my clients starting out with such passion and conviction, and then just when it was go time they would backpedal and decide that maybe it wasn’t the right time. Or they weren’t the right person and my own deepest secret of all, why did I find myself asking these same questions of my own work far too often? I took my frustration out on a walk with my dogs. On this walk, I asked myself these questions. What is the difference between those clients who had excelled in our work together and had changed lives in a big and meaningful way with their message, and the far too many who quietly tucked away their beautifully crafted talk in a bedside table drawer? What do those who are successful with their message have that the others do not? What happened next is one of those almost spiritual experiences, I’ve heard others describe but have never had for myself until then. Within 15 minutes of walking and talking this entire model came to me. Yes, even all of the words starting with C.
When I got home I wrote out the model in a large flip chart paper on my wall. I held it up against client name, after client name. Then I held it up against all my favorite well known transformational speakers and authors also voices for good in our world and found it to be consistently true. These are the characteristics of the most influential, heart-centered, transformational thought leaders. What’s cool is that this also serves as a guide for you. If you wanna make a meaningful difference through your own transformational thought leadership. I immediately began working with clients around these characteristics, and the results were exciting. When a client came to me struggling I assessed which characteristic or behavior was lacking in their work. We zeroed in on that characteristic or behavior and their path to thought leadership opened up. They were feeling stuck, often for years, and this feeling began to gently loosen. Of course, it took work and a commitment to create new habits and patterns around these characteristics and behaviors, but referring to this model made it so much clearer how to stay on track. The 5 C’s of Transformational Thought Leadership. Here are the 5 C’s of Transformational Thought Leadership that came to me in that walk in the woods. Number 1, clarity. Number 2, commitment. Number 3, confidence. Number 4, caring. Number 5, charisma, natural charisma. This model acts as a valuable diagnostic tool, as well as a clear guide for action to resolve any feelings of being stuck that you may be experiencing on your speaking and thought leadership path. The next 5 chapters cover each of these characteristics in more depth. As you read through each of the chapters, ask yourself how am I doing with this characteristic? How strong am I in this area? 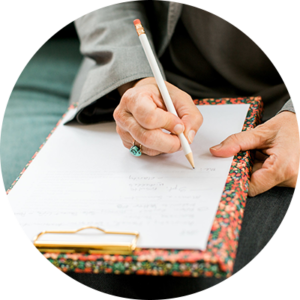 Each section has accompanying exercises you can use to address areas you need strengthened. It’s a fascinating thing to be called to serve as a speaker and thought leader. It can feel lonely and full of self-doubt at times because it’s an audacious and courageous path. There’s a good chance that you are not surrounded by people in your life who feel the same call, which may leave you wondering if you’re being self-aggrandizing or otherwise crazy. Many of us are called that, either quite directly or we can just feel it from those around us. Yet here’s what I know for sure if the call beckons it’s your sign. You are meant to do this, while you may feel alone among family and friends, know that you are absolutely not alone in the greater world. You are a part of a magnificent group of mission-driven leaders who are committed to being a force for good in our world. I for one am honored to be on this journey right alongside you. These 5 C’s are a clear and focused way to turn away from thoughts of self-doubt and uncertainty, and simply take one step after the other into service through the call you feel. When you need it, Chapter 15 is full of ideas for how to move through fear to keep taking your courageous and life changing steps forward. The next 5 chapters cover each of the 5 C’s in detail. The goal is to give you a deep understanding of how each characteristic looks and feels in your thought leadership, as well as tools to help you embolden those characteristics that need strengthening. Before we dive into the details of each of the characteristics, I wanna introduce you to one of my longtime clients who embodies the 5 C’s beautifully, and enjoys the benefits of having established herself as a thought leader in her industry. Dina is a designer who specializes in elementary schools as part of an architecture team. We met about 6 years ago when she was at the tail end of a groundbreaking research project. In this project she was part of a multidisciplinary team with public health experts, school administrators, and university researchers. The team came together to create an academic study around kids and wellness related to the built environment using a real upcoming school build project. The project was so innovative and exciting that Dina and the team were invited to present their experience at some of the most respected conferences in their industries. In fact, 6 years later Dina and her team still deliver presentations with ideas from this project, as well as many new insights that have risen after the initial project was completed. If we use Dina as an example we can see how the 5 C’s of transformational thought leadership play out in real life action. The 5 C’s of transformational thought leadership and action, clarity. Dina and her team take a stand for the power of the built environment to influence kids’ behavior and choices. Especially as they relate to wellness and learning. Her ideal audience is educators, school administrators, architects, and others who directly impact decisions made around designing and building spaces for kids. Commitment, Dina has spoken at many conferences large and small all over the world for the past 6 years. She writes for industry publications too, she is devoted to helping make schools a place for kids to thrive in health and learning. Confidence, which is competence plus conviction. Dina shares her experience with great competence and conviction when she speaks. There is no doubt in a listener’s mind as to whether Dina cares deeply about the impact her work makes in the lives of others, nor whether she knows what she’s talking about. In fact, at times my greatest challenge as her coach is helping her translate her deep expertise into terms that broader audiences will understand. Not uncommon when working with experts. Caring. The conviction Dina expresses comes from a very real connection with the difference her work makes in the lives of the kids who attend the schools she builds. You can hear this in her stories she tells about the first day of a new school opening and watching the kids leap into and enjoy the new space she was lucky to be a part of creating. Charisma, natural. As I said earlier, Dina has extensive expertise and the vocabulary to go with it. She’s an academic at heart. What I know from my years as a speaking coach is that the most engaging style of speaking is your most natural style. That said, you must connect with and serve your audience above all else. 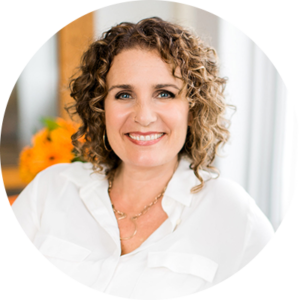 Dina works hard to weave her natural, intellectual style of speaking with captivatingly warm stories about the kids she meets, so that her audiences get the best of her while also feeling connected and served by her content. Wouldn’t it be so fun to write up one of these 5 C’s of transformational thought leadership assessments about your own speaking? After you work through the next 5 chapters you should be able to do just that. For now, you can take the assessment quiz on the book resources website page, and learn which of the 5 C’s will most embolden your thought leadership goals. You can access the book resources page at beyondapplausebook.com/resources. In the next 5 chapters, you will learn how each of these characteristics plays out in transformational thought leadership, as well as tools to strengthen any of the C’s that need support in your own leadership speaking. So there it is my friends, Chapter 5 of Beyond Applause: Make a Meaningful Difference through Transformational Speaking. That really did happen, I really did one day walking through the woods with my dogs in frustration after years of working with a lot of clients and really noticing that there was something different about the people who actually go for it with their message. Then download into my mind and heart came these 5 C’s, and I still consistently find it to be true today. So I hope you find something useful, maybe a little nugget in there as you think about these 5 C’s for yourself. When you look at them the 5 C’s, again as a reminder are: clarity, and that’s clarity of message and clarity of who you serve. Commitment, and it’s just how devoted are you to those people that you’ve decided to serve and this message that you’re taking a stand for, so that’s commitment. Confidence and I break down in the book the way I think about confidence. This is a confusing term for people and can feel kind of daunting and elusive. So I break it down into competence and conviction, and in the book, I talk about subject area competence. Your area of expertise, and then also competence in your ability to express as a thought leader. So get on a stage and share that message in a way to get their attention and keep their attention, and serve them. Then of course conviction, which really comes from the commitment. The third one conviction is also served by, which is caring. So the third C is caring, and this is a hard one to ask ourselves, but it’s an important one. Sometimes we start off with a message that matters to us for some reason, maybe we’re in a different season of life and during this season of life this message matters. We just figured out how to help our kids, make them sleep, see how I think about it. I just still remember that phase, but we went through all of the process of learning how to help our kids go to sleep. Then we now wanna teach others how to help their babies and their young kids go to sleep. Once you get into the teen years, maybe you wanna talk more about helping parents with middle school, for example. When you think about caring it can be nuanced, maybe your message needs to shift just a little bit, so that you can have that renewed conviction and energy. So that was the third one, it’s caring. So we have clarity, commitment, confidence, sorry that was the fourth one is caring. Then the fifth one is charisma. I always put natural in parentheses after that, natural charisma. This is recognizing that you have within you right now a way of sharing your ideas, a way of expressing that comes naturally to you. Now, this doesn’t mean that you don’t wanna refine that or learn best practices for the stage. When I work with clients we’re often working with their own natural style, but of course, I’m talking with them about what works best with an audience and certain time frames. There are ways you use your own natural style and weave it in with best practices around great speaking. But recognizing that you don’t wanna try to become someone else to become a great speaker. Whatever your style, that’s the essence of who you wanna be up on that stage. Makes it so much more fun for you, and the connection is so much stronger with your audience. So anyway, that just is kind of a little summary of Chapter 5 of this book. Think about for yourself of those 5 C’s if you’ve been struggling to get out there with your message, which one of these might need some emboldening. You can get the book, again reminder, michelleberryfranko.com/freebook, and in the book, there’s all kinds of exercises after each chapter. I have a chapter on each of those 5 C’s, so that means there are at least 2 exercises after each chapter that will help you embolden that particular pillar or that C.
All right my friends, as always it is such a pleasure to be with you here today. Thank you for being here. You know that I am over here cheering you on, and I wanna just… my whole goal is to give you as many resources and as much inspiration as I can to help you answer that call that lives in you. To go out there and make a difference with your message. Because here’s the thing, you were made for this. You know how I know that because you know that. So I’ll see you next week friend. Thanks for listening to this episode of Speak So It Matters Podcast. If what you heard here today was useful, you’ll love the free guide I created for you at speaksoitmatters.com/yes. Not only will you get immediate access to our power and grace speaker’s toolkit, including the presentation outline you’ll ever need. You’ll also receive weekly updates with our best resources as they’re created. I can’t wait to see out there shining your beautiful light and changing lives with your message.